The Washington Times published my review of Mark Hemshaw’s The Last Man in Tehran. 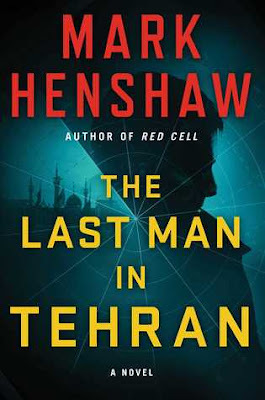 Mark Henshaw, the author of the “The Last Man in Tehran” and the three previous spy thrillers in his “Red Cell” series, is a veteran CIA analyst who served in the CIA’s Red Cell Unit. As Mr. Henshaw wrote in his debut novel, “Red Cell,” the unit is an alternative analysis unit set up by then-CIA Director George Tenet on Sept. 13, 2001 to ensure that the CIA didn’t suffer another surprise like the Sept. 11 attack. The Red Cell’s job is to play devil’s advocate and think out of the box. The unit was to discover possibilities that other analysts might overlook or dismiss. “The Last Man in Tehran” opens on Nov. 4, 1979 outside of the American Embassy, where the embassy employees have been taken prisoner by students in support of the Iranian Islamic revolution. Sitting on a bench in Honarmandan Park is an Israeli Mossad officer named Gavi Ronen. The Israeli intelligence officer was meeting his counterpart in SAVAK, the ousted Shaw’s secret police. The two intelligence officers lament the current events and say their goodbyes. Kyra Stryker, a case officer brought in from the cold due to a fiasco in Venezuela and assigned to the Red Cell unit in the first novel, has been recently promoted to be chief of the Red Cell unit. In her first days as the Red Cell chief a radioactive “dirty bomb” is detonated in the Port of Haifa in Israel. Suspecting the Iranians, the Mossad counterattack with a campaign of sabotage and assassinations. The CIA then discovers that someone in the CIA is helping the Israelis wage the covert war. The FBI is brought in to find the CIA mole and Kyra Stryker is assigned to work with the FBI. ... According to the publisher, the dirty bomb attack on Haifa was based on a fictional event which occurred in a war game that Mr. Henshaw organized and ran for the CIA. All of the historical events referenced in the novel are true and the descriptions of CIA headquarters and other locations are accurate. This realism adds to the suspense and believability of the story. “The Last Man in Tehran” is a suspenseful and action-packed novel that spy thriller fans will enjoy.